Summary of the ROV1 project. After this weekend of test diving I feel that i can conclude my first attempt to make a simple ROV. I discovered that it was indeed possible to to use small inexpensive pumps for controlling a small underwater craft. I found a way to make a watertight camera housing that was easy to assemble, used standard off the shelf parts and no glue of any kind. This allow me to make many copies and scale the design. I confirmed that it was possible to use a single CAT5 cable to communicate with the the surface and that the transmission of 240V mains power over this cable could be used in a safe way. 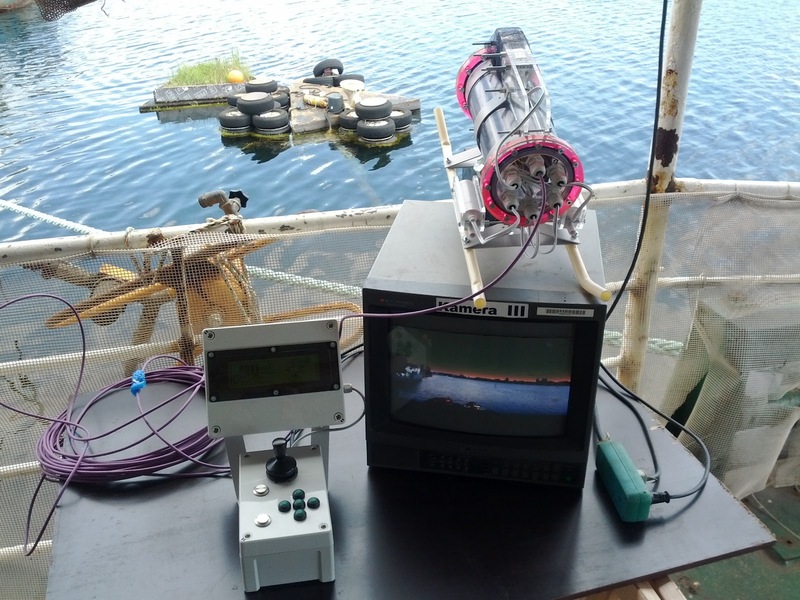 I tested the ROV several times on land and in the water to develop proper control algorithms. Shortly after I was able to dive 8 meters down to explore the bottom. ROV1 homemade by DZL, from oz2cpu on Vimeo. After using several cameras it has become clear that a single fixed focus wide angle camera gives the best result. I plan to hack one of the popular GoPro cameras so it can be remote controlled and provide a live video feed. The camera will be mounted on a pan/tilt unit inside the ROV for better coverage. An IMU and pressure sensor will be installed for closed loop control and navigation. Side thrusters may be installed for side to side control and drift compensation. Many more posts will appear here over the summer as the project progresses. Amazing! I am so glad to have found this blog–I really like the design of your underwater housing. A similar design I have seen that uses mechanical tightening to form the seal (vs adhesives) is on SubmarineBoat's website, via his page on "Hydrophone and Underwater Voice Communications". I look forward to seeing more posts about your ROV!